UGA faculty, departments, and offices are encouraged to incorporate the conference themes into their curriculum and programming, including partners in the creative and performing arts, engineering, technology, environment and design, ecology, sustainability, and in other departments, who have an interest in intersecting with the arts. The conference is an opportunity for students, faculty, and staff to engage in a conversation about the arts, environment, and technology. a2ru is a partnership of more than 40 institutions committed to ensuring the greatest possible institutional support for the full spectrum of arts and arts-integrative research, curricula, programs, and creative practice for the benefit of all students and faculty at research universities and the communities they serve. 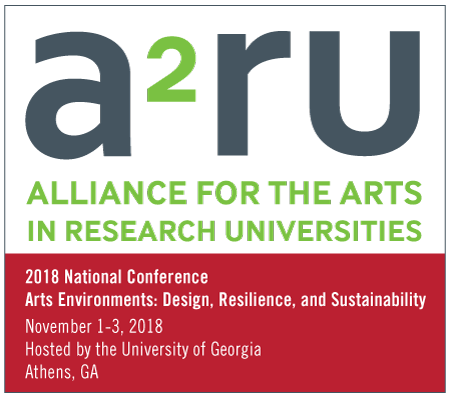 In coordination with the a2ru conference the Willson Center’s a2ru Faculty Research Cluster is accepting proposals from UGA faculty to support research projects to be featured during the time of the conference. Projects may be creative or scholarly in form, and they may be disciplinary or interdisciplinary in scope. A limited number of grants up to $1,500 will be awarded to projects that align with the theme and timing of the a2ru conference. A one-page proposal describing the project and its significance should be sent, along with a detailed budget, to the Willson Center at wcha@uga.edu. Please note “UGA a2ru Cluster CFP” in the subject line. Applications will be reviewed by a representative panel of faculty in the arts and will be judged on proposal quality and alignment with the conference theme. Please contact Isabelle Loring Wallace, iwallace@uga.edu, associate professor of contemporary art in the Lamar Dodd School of Art and associate academic director for arts and a2ru in the Willson Center, with any proposal questions. Funding for proposals selected by the committee will be available July 1, 2018 (Deadline: March 22. Notification: April). In addition to the UGA a2ru Research Cluster call, the Willson Center invites proposals from UGA faculty, students, or offices interested in connecting special projects (programs, exhibits, community engagement, etc.) with a student focus to the November 2018 a2ru National Conference. A limited number of grants up to $500 will be awarded up to projects that align with the theme and timing of the a2ru conference. A one-page proposal describing the project and its significance should be sent, along with a detailed budget, to the Willson Center at wcha@uga.edu. Please note “UGA a2ru special projects proposal” in the subject line (Deadline: March 22. Notification: April). Please contact Mark Callahan, markcall@uga.edu, artistic director of Ideas for Creative Exploration (ICE), with any proposal questions. Projects will be reviewed by a representative panel of faculty in the arts and will be selected based on proposal quality and alignment with the conference theme. Students who are interested in volunteering during the conference should contact Mark Callahan, markcall@uga.edu. Student volunteers will be recruited through early fall semester. Proposals selected from both the UGA a2ru Research Cluster CFP and special projects submissions may be presented as posters or exhibits and will be branded and advertised in conjunction with the conference and coordinated to best align with the formal conference schedule. Should I apply to the a2ru National Conference CFP, the UGA a2ru Research Cluster CFP, or both? Faculty or groups of colleagues can apply to one or both. Decisions about the national conference CFP and formal conference schedule are based on a2ru’s call guidelines and decided by a2ru’s executive committee. The UGA a2ru Research Cluster CFP regarding UGA projects in conjunction with the conference will be decided by a representative panel of UGA faculty in the arts and based on the quality of the proposal and alignment with the conference theme. Proposals selected from the UGA a2ru Research Cluster CFP may be presented as posters or exhibits and will be branded and advertised in conjunction with the conference and coordinated to best align with the formal conference schedule. Is funding available for both the UGA Research Cluster CFP and the special projects call? What is the difference? Funding of up to $1,500 is available to UGA faculty proposals selected as part of the UGA a2ru Research Cluster CFP. Funding of up to $500 is available as part of the special projects call funded through the ICE Research Cluster. Special project proposals may be submitted by UGA students, faculty, or staff. What is the formal conference schedule? The conference will take place Thursday through Saturday, Nov. 1-3. The final schedule will be posted on the a2ru website this summer. Registration for the conference will be available this summer. UGA faculty and staff will be able to register at a reduced rate. I am a student. Can I attend the conference? UGA students who volunteer and meet a minimum number of hours worked for the conference will receive free registration to all conference events. Please contact Mark Callahan, markcall@uga.edu, if you are interested in volunteering.